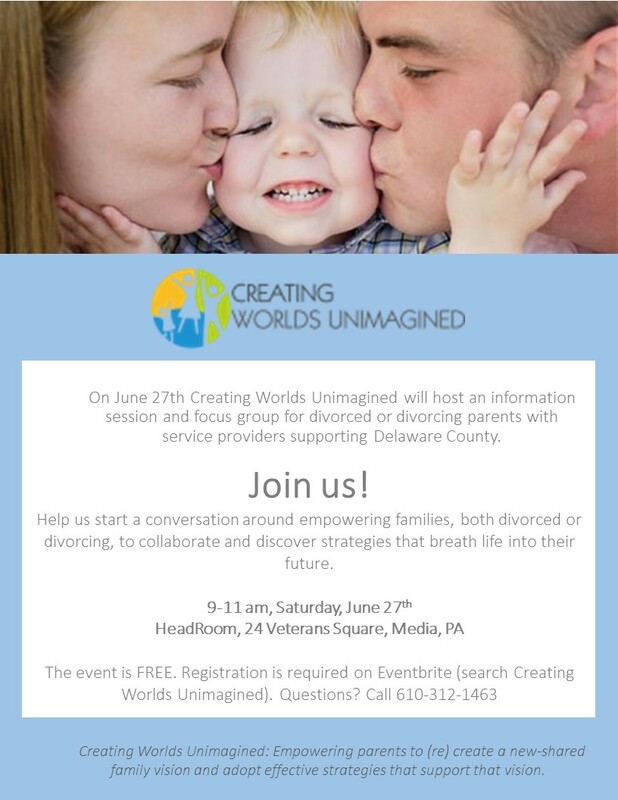 Creating Worlds Unimagined is on a mission to create a powerful community for families that are divorced or divorcing while supporting their efforts to discover and create collaborative parenting relationships. Our families may be working through upset yet are inspired by the possibility that divorcing does not mean giving up on our shared hopes and dreams for our children and our families. I’m thrilled to be the Event/Area Director for Creating Worlds Unimagined in Delaware County. We’ll be kicking-off the initiative with an information session and focus group experience on June 27. Participants will work with local service providers to identify needs of co-parents and their families and define the future of this co-parenting community. The event is free and open to open to the public. Saturday, June 27, 9-11 am, at HeadRoom, 24 Veterans Square, Media, PA. Registration via Eventbrite is required. Questions? Call 610-312-1463.